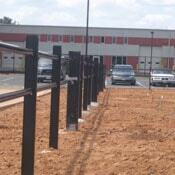 Hercules Fence is experienced in the most secure chain link fence systems available. Many of our Ornamental Fences provide the framework for fiber optic motion sensors, as well as security cameras. 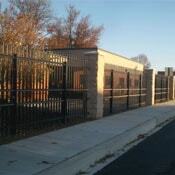 In addition, we are also very experienced in double row fence systems with multiple rows of razor ribbon and concertina wire. 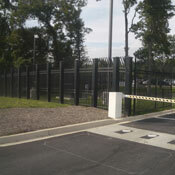 Finally, Hercules Fence can install all types of gates — regardless of size or any custom requirements. Without sacrificing the beneficial rich look of iron fencing, our high security ornamental offers the ultimate in force protection. Whether you are looking for an anti-climb curved ornamental fence or decorative iron fence with cable reinforcement, Hercules Fence is a leader within this specialized field of fencing. Similar to our other ornamental fences, high security ornamental offers a “powder coated” finish for maintenance free beauty — with the ultimate security built within the fence system. At Hercules Fence, we have trained installation crews to install many different types of cable systems — depending on the specifications and job requirements. 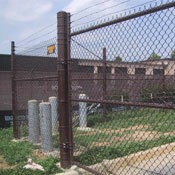 We offer all different sizes and types of cable attaching to both chain link and ornamental fence systems. Please contact an experienced commercial sales representative for more information on this type of barrier system.